Sometimes I envy the days when, if you wanted fresh vegetables, you either had to grow it yourself or had a neighbor growing it. Then you always knew just what you were getting and what to do with it. It was local and grew locally. Now the markets are full of various types of produce from all over the world; bin after bin of unknown fruits and vegetables that beg us to try them. If you have never been exposed to the wonders of fennel, you may not know “what to do with it.” So let me show you how to prepare fennel, the vegetable, not the herb, and take away the mystery. What the heck is Fennel? 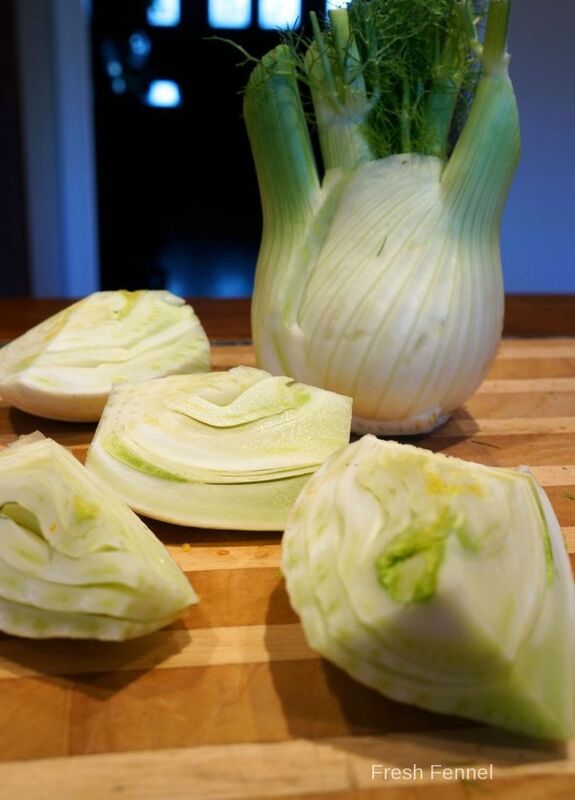 A bulb of fennel looks very much like a “ball” of celery. Often mislabeled “sweet anise,” in the supermarkets, fennel gets overlooked by those who don’t like the flavor of licorice. The confusion stems from the fact that both sweet anise and fennel contain an essential oil of similar chemical composition and share a licorice-like flavor and aroma. 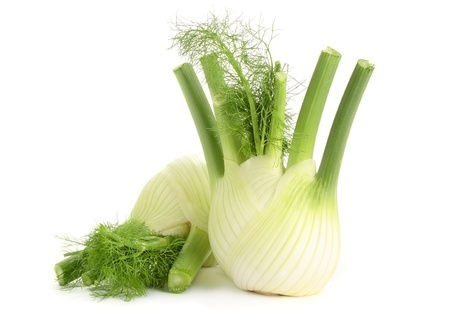 The flavor of fennel, however, is sweeter and more delicate than anise and, when cooked, becomes even lighter and sweeter than in its raw state. Fennel leaves are feathery and make a nice garnish or can be chopped and used as an herb. The top stalks can be added to soups or stocks for seasoning, but are generally too tough to eat. The first fennel grown in the United States was grown in 1824 by Thomas Jefferson when he received a packet of seeds from the American Consul in Florence. 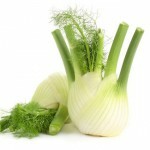 If you would like to grow fennel in your garden, be sure to choose Florence fennel for its edible bulb. Common fennel will give you edible leaves, and eventually fennel seeds, but the rest of the plant will be too tough and stringy to eat. While attending a cooking demonstration at the Food and Wine Classic in Aspen, one chef told us that fennel with a round bulb is female; flat is male. I’ve been doing some research into that and the results are MIXED. Some sources say this is true, some say this is false and some say that it has no gender at all, it is the fruit from the plant that has been fertilized with male pollen, just like squashes and eggplants. Regardless of this “research”, I have found that the round bulbs are more tender and sweeter, so maybe that proves they are female. Whichever bulbs you buy they should be white, with crisp bright greens and no cuts or bruises. And if you have the choice, choose the round ones. Start by separating the top stalks and leaves by slicing across close to the bulb. Trim the base of the bulb no more than is necessary, then quarter the bulb lengthwise. You can remove the center core (best if preparing raw) or leave it in if you are cooking the fennel. If left exposed to air for too long it may discolor, so either rub the exposed parts with lemon juice or put it in cold water with a splash of vinegar. Fennel is so versatile. When served raw it will add a crisp element, although the licorice flavor will be more prominent, or you can braise, roast or grill it. It is lovely with fish and plays nicely with tomatoes, oranges, lemons, apples, walnuts, and dill.